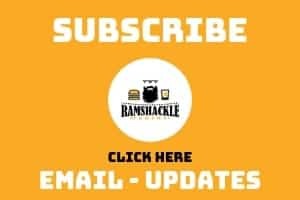 January 18, 2018 (Last Updated: March 9, 2019) - As an Amazon Associate I earn from qualifying purchases. Welcome to our deep dive into Chicago style deep dish pizza! We have already looked at several pizza recipes from the web and also a huge list of pizza styles, but now we are moving on to recipes! I thought it would be fun to give a teaser of the full recipe with our version of the best pizza sauce recipe for a Chicago deep dish. 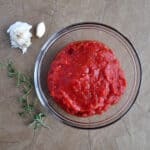 Understanding how this pizza is built can help understand the sauce and how we came up with this best pizza sauce recipe for our Chicago pie. So, first, tomatoes are on top. Because of the thickness of this pizza, cheese would burn on top. Typically, the mozzarella is on the bottom, then the toppings and finally the sauce. Maybe some parmesan would be added on top. The exposure of the sauce will give it extra bake in the cooking and an uncooked sauce is typical for this style of pizza. 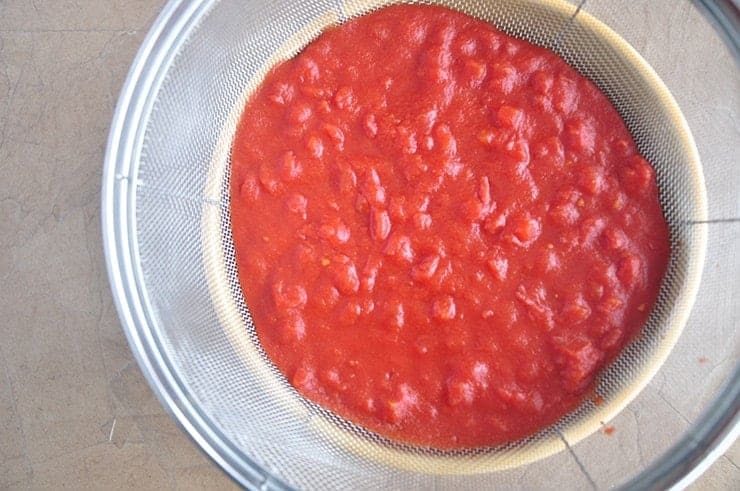 Our best pizza sauce for a Chicago style deep dish really is simple. 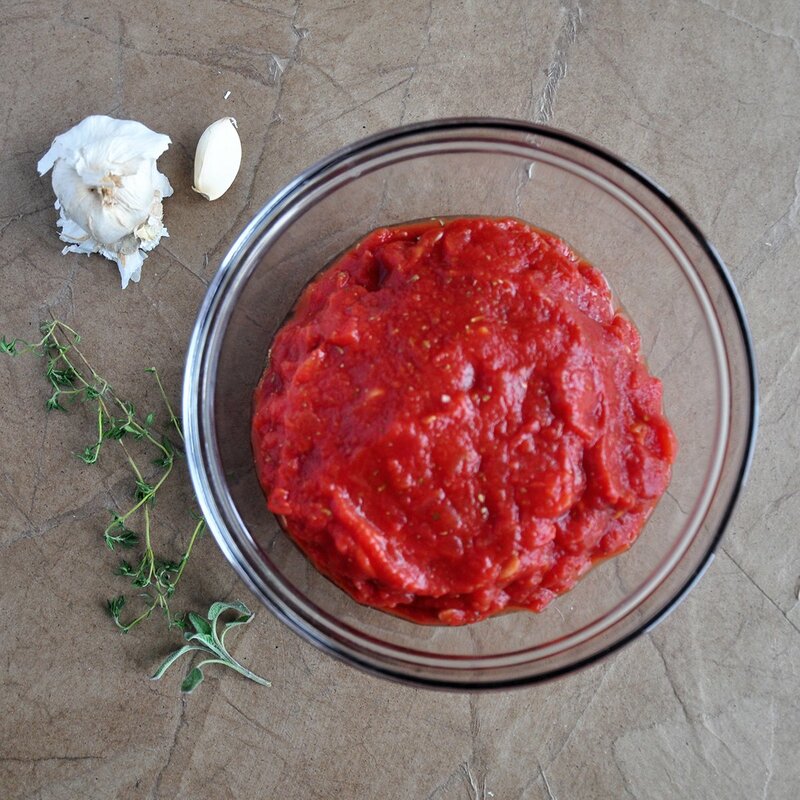 Crushed tomatoes with seasonings and garlic! Really, that is it. I purchase canned Cento petite diced tomatoes for our best pizza sauce recipe. If you can tomatoes, as we do, I have been known to use 2 quarts of them and crush them myself. For the seasonings, I use a salt and Italian seasoning mix (disclaimer below), as well as several minced cloves of garlic. I will be using dried herbs, but you can substitute fresh herbs, as well. I debated on what to use. On one hand, I thought it would be tasty to use fresh herbs, but then I thought about the price (fresh herbs are not really cheap here in winter) and the heritage. Thinking about the history of this pizza, I suspect most Chicago pizzerias in the 40s were not keeping an herb garden through the winter. It is not like fresh herbs were available to everyone in the olden days during winter months. That stuff had to be shipped in, so I imagine (and I am speculating here), that dried herbs were the norm rather than the exception. Not to mention, there are additional costs associated with fresh herbs. I believe dry herbs probably are legit and maybe more authentic to the reality of this pizza. I will, more often, use fresh herbs during the summer. When I use fresh herbs, I mostly think about thyme and oregano when it comes to my Italian sauces, so those would be my primary spices. I may add sage and rosemary in smaller quantities. 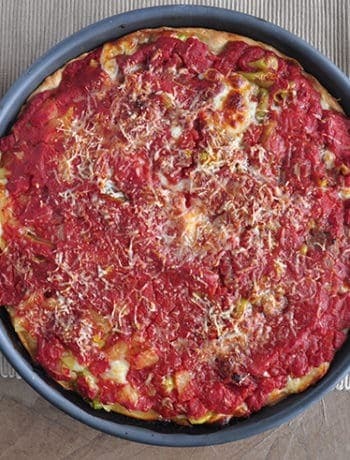 Are you making a Chicago deep dish pizza? Well, the sauce is simple and super tasty! 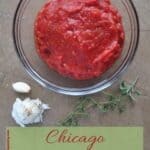 I hope you enjoyed our best pizza sauce recipe for a Chicago deep dish. I really look forward to constructing this pizza with you and exploring the heritage of Chicago style deep dish pizza! Please pin this post, follow me on Pinterest, and follow me on Instagram! There is no such thing as a Great Deep Dish Pizza. If I want Lasagna and bread that is what I will eat. meh. You might be making it wrong or going to the wrong place if your crust is like bread, but if Chicago deep dish isn’t your thing, thats cool. I get it. Everybody has different tastes. A proper Chicago deep dish, IMO, uses the same amount of flour as a Neapolitan. The crust should be thin and strong enough to hold ingredients, which it does have more of. It is cooked, kneaded, and risen differently than a great Neapolitan. Which, I think the best of the best Neapolitan will beat out the best of the best Chicago deep dish, but they just aren’t the same thing. I mean, a two day risen crust with homemade mozzarella, some simple ingredients, and cooked at extremely high heats just isn’t the same thing as something coming close to a tomato pie. 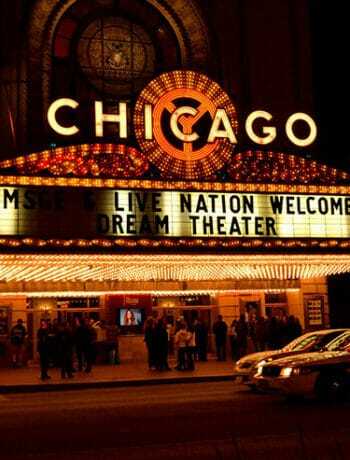 Besides, if a Chicago deep dish it is like lasagna and bread (which it shouldn’t be), is that so bad? Personally, I have an affinity for both(lasagna and bread) and have made both from scratch. This is interesting. I always use my regular pizza sauce for deep dish pizzas too. Must try this some day. I have fresh oregano growing in my garden and I use it in various dishes, but never on a long-baked pizza. For me, dried oregano has the ‘right’ flavor for Chicago or other long-baked pizza. As the herb dries, the flavor changes in the direction of pizza, becomes more pizza-appropriate, if that makes any sense. Certain flavors evaporate, others are concentrated. >fresh basil has no place on a pizza baked for 30 minutes.. most Neapolitan and neo- pizza makers put the fresh basil on after the pizza comes out of the oven. I mean, I can see this argument when the herbs are layered on top, but this just isn’t the case here. This is chopped and mixed. Why? If it is mixed with the sauce and you have the ingredient, it is appropriate. If you are mixing with a dry ingredient into a wet sauce, aren’t you just rehydrating it?